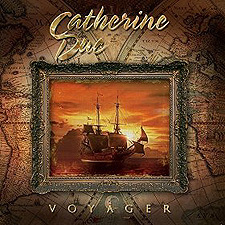 Simply put, Catherine Duc is not only a musical artist of the highest order, but a creator of visions that sweep your mind in the most colorful, breathtaking ways. The Australian composer and producer of music blends elements of ambient, classical, electronica and World music into her works of art, each and every time. In 2005, Duc issued her debut album, Visions and Dreams and already her work has been aired on Australian Broadcasting Corporation's ABC Jazz. Here on her new album, Voyager, Duc once again takes us on a musical journey through her unique world of ambient, Celtic, electronica and World music. Duc's talents as a multi-instrumentalist and vocalist means that she always brings her A game to the recording process, which means you already know that this near-instrumental new offering will be something beautiful to behold. As water gentles laps upon land, our stunning contemporary Celtic journey begins with the luscious, evoking 'Owen's Boat', before heading beautifully into 'Inishowen Dawn.' [For those not in the know, Insihowen is a stark, and yet stunning peninsula at the northern-most reaches of Ireland]. As the camp fires burn, the owl's hoot, we are next invited into the world of 'Vardo,' a track that ebbs and flows with various cultural orchestrations, and yet continues to perfect complete harmony throughout. The first vocal track on the album is brought forth next, as 'Mantra' is performed. Featuring Natalia Christiana on vocals, it simply could not have sounded any better as both Natalia and Catherine combine their talents delightfully. Next up is 'Once,' before one of the best tracks on the album, for my money, the inspired acoustic guitar and gentle piano combination, tinged with the undercurrent of waves lapping on the shore, 'Antilles.' After that we next get yet another stand out track, this time in the form of 'Lhasa Lullaby,' before the quieter melodies of 'Black Is The Colour' are waving over us. This track finally allows Catherine herself to sing, and my oh my, what a beautiful voice she possesses. It actually makes you wish she had added vocals to some of the other tracks, for it's ethereal calmness is just what this world needs more of. The hauntingly spooky cello string arrangements of 'The Seventh Chamber' are next, and are followed by another Catherine-sung track, the acoustic guitar-led 'Seallaibh Curraight Eoghainn,' a quick track that bounces and skips along so in time with life that you simply cannot stop your feet from moving in musical step along with it. The album, which noticeably features a lot more Celtic influences compared to her previous album; with a greater focus on live instruments ie: acoustic and electric guitars to mandolins, Irish flutes and bagpipes, then wraps up with the faster-paced 'Essence Of Dreams (Essential Dance Remix), which is a fantastic way to bring this incredibly fresh collection of Celtic and World-inspired songs to a close.